The Supreme Court has expressed displeasure over the government’s failure to frame a national policy on the retirement of judicial officers and majority of states not formulating rules for extending their retirement age from 58 to 60 years and re-employment for two more years thereafter. The Centre said today that “outside elements” were fomenting intra-tribal conflict in the sensitive North-East where the ground situation was showing signs of improvement. It is not only the “myth” that he was invincible, which was grounded at the recently held Assembly poll in Bihar, but the brand associated with the name of Mr Lalu Prasad Yadav also seemed to be on the wane. The CBI is awaiting a notification from the Department of Personnel and Training to register a disproportionate assets case against former Haryana Chief Minister Om Prakash Chautala. The Pratapsinh Rane government in Goa received a major boost today after the Panaji Bench of the Bombay High Court set aside the Goa Legislative Assembly Speaker’s order disqualifying an Independent MLA Filipe Neri Rodrigues in February this year. Lok Sabha Speaker Somnath Chatterjee today hosted a dinner meeting for top UPA and NDA leaders to draw their attention to the manner in which the MPLAD scheme is functioning and reiterated his well-known position that it should be done away with. The decision to give a sales tax holiday during the week-long Saifai Mahotsav at Chief Minister Mulayam Singh Yadav’s native village in Etawah has been challenged through a public interest litigation. The Dravida Munnetra Kazhagam today charged the Tamil Nadu Government with politicising flood relief distribution and trying to cover up its inefficiency by arresting its councillor with false charges of spreading rumours leading to the death of 42 persons on Sunday’s stampede. For Karnataka Chief Minister N. Dharam Singh there is a lot in a name. Heading what is perceived to be a tottering coalition government, the Chief Minister has followed up the decision to change Bangalore's name to Bengaluru with another brainwave. The Northern Railway will run winter special trains from New Delhi to Jammu Tawi, New Delhi to Mumbai Central and Hazrat Nizamuddin to Trivandrum Central from today to clear extra rush of passengers. Indian Missions in many foreign countries are unable to cope with rush for visas for travelling to India and it is costing the country dear in terms of tourist arrivals, according to Tourism Minister Renuka Chowdhury. The Madhya Pradesh Government today moved to break the deadlock between the management and striking employees of the super-speciality Bhopal Memorial Hospital and Research Centre, which was set up under a direction of the Supreme Court specially to provide medical care to the MiC gas leak affected people. Awardees of scholarships given by the University Grants Commission will no longer have to make countless trips to college bursars for collecting their money. Empowered by VISA Power, all they would need to do is swipe their smart cards and collect the cash. Law Minister H.R. Bhardwaj has stressed on right of every one, including those from deprived sections, to get good education and said the Bill providing for reservation for the SCs and STs in unaided private institutions was aimed at achieving this goal. Fifteen Indian bomb technicians representing four separate law enforcement organisations today graduated from the US Department of State-sponsored Explosive Incident Countermeasures Course, held at the NSG complex in Manesar, Haryana. Bihar’s Bhojpuri dialect has crossed the national boundaries with Bhojpuri films and songs being shot in London to Muscat. On December 22 the first Bhojpuri musical show is going to be held at Oman Sheraton hotel. The president of the All-India Granite and Stone Association, Mr Munavar Basha, told the mediapersons yesterday that the next fair to showcase varieties of marble, sand stones, granite, slabs and their processing and trading would be held in Bangalore from February 1 to 5. Members of Parliament belonging to Punjab, Haryana and Himachal Pradesh today met Prime Minister Manmohan Singh and reminded him of his promise to upgrade the PGI, Chandigarh. The government has appointed a committee to have a new police law in view of the changing pattern of crime in the country, Home Minister Shivraj Patil said today. He told the Rajya Sabha that the committee is expected to give its report within six months. Twentyseven legislators of the Opposition Congress were suspended from the Chhattisgarh Assembly after they trooped into the well of the House, demanding a CBI inquiry into the disappearance of huge quantities of rice meant for distribution under the food-for-work programme from a state warehouse. The Ethics Committee of the Rajya Sabha, probing the cash-for-questions sting operation by a TV channel involving the lone Upper House member Chhattrapal Singh Lodha, will submit its report on Friday. Tourists stay out of Jim Corbett National Park. Reservation in pvt institutions: BJP to move an amendment. Mumbai blasts: CBI on trail of new suspects. Inmates of Gwalior Central Jail display their tooth power. Saif Ali Khan rocks New Delhi. Bangalore gears up to meet rose demands. The Supreme Court has expressed displeasure over the government’s failure to frame a national policy on the retirement of judicial officers and majority of states not formulating rules for extending their retirement age from 58 to 60 years and re-employment for two more years thereafter. It has directed the government to frame the policy to utilise their services to reduce the mounting burden of pending cases 12 years ago. The court said in the absence of any rule framed by the states, its guidelines of 1993 laid down in the All-India Judges Association case would continue to regulate the retirement of judges in the subordinate judiciary. The court, however, noted with concern that only few states, including UP, had framed the law enhancing the retirement age to 60 years while most others had not been able to lay down the rules despite a clear direction issued in the 1993 judgement. The court had laid down the guidelines following Justice Shetty Commission’s commendation with slight modification in it. As per the guidelines the retirement age be hiked to 60 years and if there were vacancies in the cadre of District Judge, the state governments could formulate appropriate rules for re-employment of judges up to the age of 62 years. But the court made it clear that the extension in retirement age to 60 years would not be automatically available to the judicial officers as it would be based on the scrutiny of their past record and performance. “The benefit will be available to those who, in the opinion of the respective High Courts, have the potential for continued useful service. It is not intended as a windfall for the indolent, the infirm and those of doubtful integrity, reputation and utility,” it said, adding that their utility had to be assessed and evaluated by a committee of respective High Court judges, headed by its Chief Justice. It said the exercise had to be undertaken by the High Court prior to attaining the age of 58 years by a judicial officer by following the procedure of “compulsory retirement” rules as laid down in the respective service rules applicable to the judicial officers. The re-affirmation of the guidelines came in a judgement on a petition of Additional District Judge from Jharkahand, Mr S.D. Singh, who was denied the extension by the State High Court after attaining the age of 58 on December 31, 2003, in absence of any rules framed by the state government. The ground situation in the region was showing signs of improvement with people coming forward to speak against militants, Home Minister Shivraj Patil said in the Rajya Sabha. Replying to a brief discussion on the calling attention on violence in the tribal-dominated areas in Assam, he said ground rules for the ceasefire clearly laid out that militants should not wander with arms. Mr Patil agreed with Opposition members that “outside elements” were behind the recent violence and said steps were being taken to identify and take action against them. He said an Inquiry Commission, headed by a retired High Court judge, had been set up to look into violence in the tribal areas. Rejecting the demand for despatch of an all-party delegation to the affected areas, Mr Patil said a delegation, headed by the state Assembly Speaker, had visited the area and sending another delegation, when the situation was getting normal, was not advisable. Deputy Leader of the Opposition in the Rajya Sabha Sushma Swaraj took exception to the Home Minister’s statement that there was tension and rivalry between the Karbis and Dimasa tribes. “These tribes consider themselves progenies of Bheema and Sugreeva and both wanted to live peacefully. But there were some forces which wanted friction between the two tribes. Please don’t believe in the official version and send a five-member all-party Parliamentary delegation to understand for themselves,” she said. Meanwhile, expressing serious concern over the growing nexus between Nepal Maoists and Naxalites in India and their graduation from traditional to sophisticated weaponry, the government today did not rule out a joint strategy with the Nepalese Government to combat the burgeoning threat. “It is not true that we don’t have a strategy. We already have a strategy to fight the menace. But if required and as time passes, we will think about it (joint strategy),” Union Home Minister Shivraj Patil told the Rajya Sabha during question hour. Replying to supplementaries on the Naxal issue, the Home Minister said there is some change in India’s approach towards Nepal after the end of democracy in the Himalayan Kingdom. This is evident from the drop in the sale of Lalu Prasad look-alike dolls in Patna. Even before elections these were like “hot cakes” for the children of Patna and other parts in the state. First it was introduced by a Mumbai-based manufacturer and later on by a few others. The dolls, with Lalu’s favourite kurta-Pajama attire, used to be sold from prices ranging from Rs150 to Rs450. Some were improvised with lantern in his hand — the symbol of the RJD. And not only children, even these were found in the houses of almost all RJD supporters. A shop owner on Dak Bungalow Road, Kedar Singh, who earlier made a brisk business in Lalu dolls, admitted the demand for these was on the decline. The same was the view of Abhay Kumar in Rajendra Nagar. But the shop owners ruled out the possibility of replacing Lalu dolls with that of Mr Nitish Kumar. 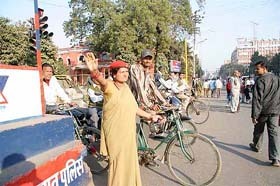 “Mr Nitish Kumar lacks the humorous and non-serious aspect of Mr Yadav. Mr Kumar’s serious image was not ideal as a brand like Lalu Prasad in helping us to market such dolls which look like him,” remarked a shop owner on Boring Road. A recent survey by a local website as who could be rated as “zero” of Bihar in 2005, the majority voted that Mr Lalu Prasad was a flop. And the “myth” surrounding Mr Yadav came to a full circle as the deadline set by the Building Department for Mr Yadav and Mrs Rabri Devi to vacate 1 Aney Marg official residence for incumbent Chief Minister Nitish Kumar expired today. Mrs Rabri Devi is reportedly unwilling to vacate the 1 Aney Marg house before the present “kharmas” that comes to end on January 14. It was reliably learnt that although the department was not in a mood to officially extend the deadline to vacate the official residence any further, Mr Nitish Kumar was unlikely to push the issue hard and not allowing Mr Yadav to politically capitalise on the same. Mr Nitish Kumar evaded a direct reply on this issue and told the media that it was up to them to decide as the new bungalow at 10 Circular Road, as being chosen by Mrs Rabri Devi herself, was already allotted to them. The CBI is awaiting a notification from the Department of Personnel and Training (DoPT) to register a disproportionate assets (DA) case against former Haryana Chief Minister Om Prakash Chautala. “We have not received any notification as yet from the DoPT for the formal registration of a DA case against Chautala though the Haryana Government is understood to have forwarded its request to the Centre,” a CBI source told The Tribune tonight. The source, however, pointed out that the agency’s anti-corruption unit will register a DA case soon after receiving the notification from the Centre and conduct further probe. It may be recalled that the CBI had written a letter to the Haryana Government a couple of months back pointing out that during its probe into the appointment of Junior Basic Teachers (JBT) on the directions of the Supreme Court, the agency had come across some evidence suggesting alleged amassing of wealth by the former Chief Minister while serving as a “public servant”. The CBI had also urged the Haryana Government to issue a notification under the Delhi Special Police Establishment Act for clearance from the Centre, so that it could widen the scope of its investigations in the JBT scam and include the DA case also. As part of its probe into the JBT scam, the CBI had questioned Mr Chautala on October 20 in Delhi. Rodrigues is an Independent MLA who withdrew support to the then BJP government headed by Manohar Parrikar and backed the Congress Party-led government. The then speaker of the Goa assembly Vishwas Satarkar however disqualified Rodrigues under the anti-defection law on the grounds that he had joined the BJP even while he was an Independent MLA. Acting on a petition by Rodrigues, Justice D D Sinha and Justice Nelson Britto of the Bombay High Court set aside the speaker’s order disqualifying Rodrigues. In their 126-page judgement, the court ruled that the Speaker had not acted judiciously. The Speaker did not adhere to the principles of evidence and fairplay, the court said. Further, the court deemed that the order was irrational, unreasonable and was passed in bad faith. The then speaker himself came in for criticism from the court which ruled that his approach was against natural justice. Senior Congress party leaders in Goa are now demanding that Rodrigues be re-inducted into Rane’s cabinet. AICC General Secretary in charge of Goa Margaret Alva told party leaders in Panaji that she would discuss the matter with party president Sonia Gandhi. Under this scheme, a sum of Rs2 crore is placed at the disposal of all MPs for the development of their respective constituencies. Although Mr Chatterjee has voiced his opinion on the matter several times in the recent past, his decision to discuss it with the top political leaders today follows the second sting operation, conducted by Star News, showing seven MPs accepting bribes for sanctioning development projects from the funds available under this scheme. No decision was taken at today’s dinner meet though there was a freewheeling discussion on the subject. Among those who attended the dinner included Prime Minister Manmohan Singh, former Prime Minister Atal Bihari Vajpayee, Vice-President and Rajya Sabha Chairman Bhairon Singh Shekhawat, UPA chairperson Sonia Gandhi, Leader of the Opposition in the Lok Sabha Pranab Mukherjee and L.K. Advani. Mr Jaswant Singh, Leader of Opposition in the Rajya Sabha, was invited but was unable to attend. The latest expose on the use of MPLAD funds has triggered a debate on the future of the scheme as a number of MPs have demanded that this scheme be done away with. Sources close to the Lok Sabha Speaker maintained that even before the bribe scandal came to light, Mr Chatterjee had publicly stated that the scheme should be scrapped and the same funds be sent directly to the district planning authorities. Since this decision can only be taken by the political parties, Mr Chatterjee took the initiative to place this issue before the leaders of the two major political formations so as to spur a debate on the futility of continuing with the scheme. The Speaker also drew the attention of the leaders to several reports which had pointed to the abuse and misuse of MPLAD funds. A Lucknow-based advocate has filed a PIL mandamus against the state government not to grant trade tax exemption to the extent of 12 per cent during the mahotsav from December 21 to 27. The state of UP, the Principal Secretary, Finance, the Trade Tax Commissioner, the Chief Minister and the DM of Etawah have been mentioned as respondents in the PIL. On Tuesday, amidst speculations of “would it, wouldn’t it” the state government repeated last year’s bonanza to residents of the Chief Minister’s native village during the state-organised mahotsav graced by Bollywood stars and pop singers last year. Governor T.V. Rajeswar formally issued a notification on 20 December under Section 4 (c) of the UP Trade Tax Act, 1948, exempting the sale of taxable goods sold at the mahotsav during December 21 to 27 from the payment of tax under the Act. This exemption is confined only to retail sales and is not available to sales made by a dealer to another dealer. The hottest items to be sold during the festival last year were four-wheelers and two-wheelers as both dealers and customers realised that the maximum gains to make during the week-long tax holiday was on such expensive items. During the week-long mahotsav 2,390 four-wheelers and 4,696 two-wheelers were sold. This exemption had cost the government approximately Rs14 crore last year. This year sources estimate a loss of a minimum of Rs30 crore to the government exchequer as even people from outside might avail themselves of this benefit during the festival. Almost every prominent brand of luxury vehicles — four-wheelers and two-wheelers — has put up a stall at the mahotsav at Etawah where the entire range has been put on display. The nervousness of car dealers in Lucknow can be grasped by advertisement placed in leading newspapers by a car dealer promising Saifai prices in the city. Charging Chief Minister Mulayam Singh Yadav of squandering away public money to nurture his pocket borough, Leader of the Opposition in the Vidhan Sabha Lalji Tandon said the move was completely unprecedented in the state. It was not even extended to the well-established exhibition traditionally held at Aligarh every year, he pointed out. The Dravida Munnetra Kazhagam (DMK) today charged the Tamil Nadu Government with politicising flood relief distribution and trying to cover up its inefficiency by arresting its councillor with false charges of spreading rumours leading to the death of 42 persons on Sunday’s stampede. DMK President M. Karunanidhi alleged that the arrest was only to cover up the inefficiency of the administration in arranging proper distribution of flood relief, which led to the stampede. He said if an arrest had to be made for spreading rumours, it should be the AIADMK’s 130th division secretary Bhaskaran, who had announced through a public address system that relief material would be distributed early that day. Politicising the issue only exposed the AIADMK government’s irresponsible and uncivilised nature. The DMK would hold a public meeting here on December 25 in which leaders of DMK-led Democratic Progressive Alliance would participate to condemn the “vengeful” attitude of the AIADMK government against the opposition. For Karnataka Chief Minister N. Dharam Singh there is a lot in a name. Heading what is perceived to be a tottering coalition government, the Chief Minister has followed up the decision to change Bangalore's name to Bengaluru with another brainwave. Giving Kannada names to all tier-two cities of the state. This decision is also likely to be implemented, along with Bangalore turning Bengaluru, by November 1 next year to coincide with the golden jubilee celebrations to mark the foundation of the state. If the Union Home Ministry gives its nod to the proposal, tier-two cities in the state will have new names of Mysooru instead of Mysore, Huballi instead of Hubli, Belagaavi instead of Belgaum, Mangalooru instead of Mangalore, Vijapur instead of Bijapur and Kalburgi instead of Gulbarga. The Chief Minister, while making this announcement in Gulbarga on Sundays, said almost all entire cabinet was in favour of doing away with colonial names and giving back the old cultural names to the cities of the state. He claimed the golden jubilee celebrations were the most appropriate time to do so. The matter will first be taken up by the state cabinet following which it will be sent for approval to the Union Home Ministry. Kannadiga writers and intellectuals have welcomed the move with U. R. Ananthamurthy, who was behind the demand to revert to the old name of Bangalore, saying the government is only honouring the feelings of the people. Others claim the new names like Mysooru are already pronounced as such by the residents of the state and that the move will only give official recognition to these pronounciations. In Kannada most names are pronounced after affixing the vowel "u" to them with even "table" and "bench" becoming "tablu" and "benchu". Though change in the colonial names of cities may be acceptable, there could be problems in changing the names given to the cities of Gulbarga and Bijapur by the Bahamani Sultans. According to a press note issued by the Northern Railway here today, the 0403 New Delhi-Jammu Tawi will leave New Delhi station at 9.30 pm and reach Jammu Tawi at 7 am the next day. The special train will run on December 21, 23, 25, 27, 29 and 31. In the return direction, the 0404 Jammu Tawi-New Delhi Jammu Tawi special train will depart from Jammu Tawi at 7.45 pm on December 22, 24, 26, 28, 30 and January 1 to reach New Delhi at 6.45 am the next day. The train willstop at Panipat, Ambala Cantt, Ludhiana, Jalandhar Cantt, Chakki Bank stations en route in both directions. The 2952 A New Delhi-Mumbai Central Special Rajdhani train will leave New Delhi at 2.35 pm on December 23 and 31 to reach Mumbai Central at 8.20 am the next day. In the return direction, the 2951 A Mumbai Central-New Delhi Special Rajdhani train will leave Mumbai Central on December 25 and January 2 at 2.30 pm to reach New Delhi at 10.20 am the next day. The train will stop at Hazrat Nizamuddin, Kota, Ratlam, Vadodara and Surat stations. The 2432 A Hazrat Nizamuddin-Trivandrum Special Rajdhani train will leave Hazrat Nizamuddin on December 22 at 11 am to reach Trivandrum at 6.10 am the third day. In the return direction, the 2431A will depart from Trivandrum on December 24 at 7.15 pm to reach Hazrat Nizamuddin at 1.50 pm the third day. She told the Rajya Sabha during Question Hour yesterday that the Indian mission in France, for example, was able to give only about 135 visas per day against a demand of 1,000. “This is actually turning away tourists...We have approached the Ministry of External Affairs,” she said in response to a question. Lamenting inadequate number of airports, airlines and other facilities, including infrastructure and hotel accommodation in the country, she said the Tourism Ministry was willing to sign MoUs with airlines and airports to find ways to increase the tourist inflow. She said the ministry had also approached the Urban Development Ministry and state governments for the allotment of land for budget hotels. The government was also encouraging budget accommodation at various places in the country. She urged state governments to allocate 10 per cent of their budget in sub-plans for promoting tourism. The minister said 16 states had been identified in the Buddhist circuit as part of the drive for promotion of religious tourism. She said the ministry had also approached the Planning Commission for help in building tourist infrastructure. The Madhya Pradesh Government today moved to break the deadlock between the management and striking employees of the super-speciality Bhopal Memorial Hospital and Research Centre (BMHRC), which was set up under a direction of the Supreme Court specially to provide medical care to the MiC gas leak affected people. Following a request from the concerned citizens, Minister of Bhopal Gas Leak Disaster and Relief Babulal Gaur directed secretary of the department M.M.Upadhyaya to talk to both sides in order to find an acceptable solution to the deadlock. The 650-odd BMHRC employees, including junior doctors, have been on strike since December 3 demanding pay revision. The management, instead, started termination of their services. The hospital has been cleared of the patients. At least 15 patients have died for want of immediate medical care, five of them while they were being transferred from BMHRC to other hospitals. The hospital, when functioning, received 20 to 30 patients in a serious condition every day. Its OPD was visited by 1500 to 2000 patients daily. The BMHRC employees had gone on strike in June also. They had called off the strike after the management set up a committee to consider their demands. The committee was said to have recommended revision of pay scales of the employees. After waiting for the management to act upon the committee’s recommendations, the employees again went on an indefinite strike on December 3, the 21st anniversary of the gas leak disaster. Awardees of scholarships given by the University Grants Commission (UGC) will no longer have to make countless trips to college bursars for collecting their money. Empowered by VISA Power, all they would need to do is swipe their smart cards and collect the cash. Students, who are recipients of the Indira Gandhi PG Scholarship for Single Girl Child and the National Merit Scholarship, will be given smart cards that will allow them to collect their scholarship money. The UGC has signed an MoU with a leading private bank, wherein the bank will provide a debit or a pre- paid card to students, and they will be able to access their funds when required. The UGC will have to fund the accounts maintained by the bank from where the money will be utilised for disbursal. The commission will have to provide bank details of the eligible students and an authorisation letter to open their account. The smart cards being distributed from January, 2006, can be used at all VISA ATMs and there will be no fee charged, including withdrawal and annual fee. The bank will open savings accounts for the awardees in all serviceable locations, but in places where the account cannot be opened, the bank will issue a pre- paid card. Students can use the pre-paid card for the amount loaded on the card account. For those issued a debit card, daily limits for ATM withdrawals will be set at Rs 5,000 per day for ensuring safety of the funds. The minister expressed his views here last night while releasing a book on the Supreme Court’s judgement on private professional institutions, striking down reservation there without a statutory provision, which necessitated bringing the 104th Constitution Amendment Bill by the government. In fact, the Supreme Court itself had said the government was free to bring a legislation to providing reservation in unaided private professional institutions. Appreciating the role of minority institutions in “excelling” in the field of education, the Law Minister said they needed special protection. The SC in its earlier judgement clearing ambiguity in respect of reservation in private institutions, had held that the unaided minority institutions were free to admit 100 per cent students from their community within the state and outside as they were protected under the constitutional provisions. During the course (November 3 to December 21), the technicians learned the assessment, neutralisation and safe disposition of manufactured and improvised explosive/incendiary devices and materials, enabling them to identify and evaluate explosive devices and to implement a correct course of action to neutralise/render safe improvised explosive devices, the US Embassy said here today. As part of the graduation ceremony, US Charge Robert O Blake presented Indian officials with $250,000 worth of equipment, which were used for bomb disposal. The course is one of 10 courses presented to the Government of India in 2005 through the State Department’s Anti-terrorism Assistance Programme (ATA). Since 1995, Indian law enforcement officers have participated in 35 ATA courses. Bihar’s Bhojpuri dialect has crossed the national boundaries with Bhojpuri films and songs being shot in London to Muscat. On December 22 the first Bhojpuri musical show is going to be held at Oman Sheraton hotel. Mrs Reeta Das, a noted figure in classical music here, said, “Bhojpuri music is as melodious as Bhojpuri language itself is”. The show is expected to be a great hit because of the reported presence of popular artistes from the Indian Bhojpuri film industry. Eminent artistes like Kalpana and Manoj Tiwari will be the star attractions. And forget the paddy fields of Gangetic plains alone, the Bhojpuri films now even set the Thames on fire. From wooing his ladylove in a Bihar village, the hero has now shifted his romantic antics to the Trafalgar square in London. Writer-producer Mehmood Ali, who is making “Babul Pyaare “and “Dil Deewana Tohar Ho Gayeel” in London, recently told the media that going by the recent boom in Bhojpuri cinema, the British capital has emerged as the favourite location of the filmmakers with half-a-dozen movies currently being shot there. Bhojpuri is the main language spoken in the states of Bihar, Jharkhand and the Purvanchal region of Uttar Pradesh. It is also spoken in Guyana, Suriname, Fiji, Trinidad & Tobago and Mauritius. The president of the All-India Granite and Stone Association (AIGSA), Mr Munavar Basha, told the mediapersons yesterday that the next fair to showcase varieties of marble, sand stones, granite, slabs and their processing and trading would be held in Bangalore from February 1 to 5. Mr Basha stated that the fair was organised on a massive scale every alternate year. The fair to be held in the cyber city will have more than 1,000 stalls, besides pavillions of Italy, France, Spain and Korea. Mr Basha informed that apart from participants from different parts of the country, there would be around 200 visitors from abroad also. The star attraction of the fair would be the Shilpgram where craftsman will display their work and obtain orders. Congress spokesperson Anand Sharma told TNS here that the Prime Minister was very reassuring about his commitment to upgrade the facilities at PGI. Members of Parliament who called on Dr Singh on Wednesday afternoon were Rajya Sabha members M.S. Gill, Ambika Soni, and Dharampal and Lok Sabha MP, Naveen Jindal. Mr Sharma said that they requested the PM to modernise PGI as it is a major referral centre in northern India. The government has appointed a committee to have a new police law in view of the changing pattern of crime in the country, Home Minister Shivraj Patil said today. He told the Rajya Sabha that the committee is expected to give its report within six months. “We have appointed a committee for a new police law. We are expecting a report within six months,” he said during Question Hour. He said the country had many laws to deal with crimes, including the IPC and CRPC. “When we try to control crime, we depend upon such laws. We are also in the process of amending the existing law.” he added. After nearly an hour-long discussion this evening, Dr Karan Singh, heading the committee, said the panel would meet again tomorrow to finalise its report. Mr Lodha is now under suspension.